by Benjamin T. Conner. Wm. B. Eerdmans Publishing Co., 2011. This short, but intelligent work is a reflection on the development of missional church theology. Growing out of the concern that the church has lost part of its reason for being has led to what many believe is a crisis in ministry. Benjamin Conner is Associate Professor of Discipleship at Western Theological Seminary in Holland, MI. He begins with a brief historical recollection of the main leaders in the missional church movement, then offers his own definition: “Missional theology is a kind of practical theology that explores in every aspect of the theological curriculum and praxis of the church the implications of the missional nature of God, with the purpose of forming congregations to better articulate the gospel and to live faithfully their vocation to participate in the ongoing redemptive mission of God in a particular context." His emphasis is clearly on practice and context. 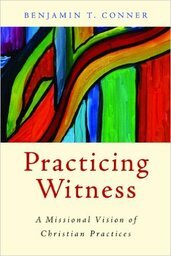 In the conversation that follows he affirms the work on Craig Dykstra’s “Practicing Our Faith” conversation by asking three questions of practical Christian witness: 1) What’s going on here? ; 2) What ought to be going on here? ; and 3) How might a faithful Christian respond? The book contains many real life situations and practical suggestions.